Another class I had was Assistive Technology. We had some really cool projects. The first was we had to design an assistive technology for someone. It could be high tech or low tech. 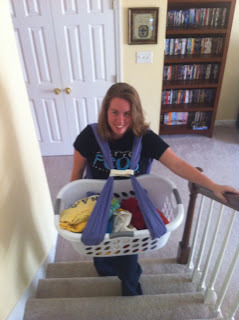 I came up with a hamper with straps (a twin top sheet cut in half) to carry laundry up the stairs. It can be worn three different ways. This was designed for someone with osteoarthritis, but could be used for a variety of diagnoses, such as ALS or Parkinson's. One of my teachers wanted to make it for her sons on crutches. Success! We also help a family design their home, so that their son with muscular dystrophy could live independently. I was on the team that designed the son's bedroom. It was very rewarding to see a real family react to your ideas. The ideas they were most excited by from us were not even really adaptive. One was a TV coming out of a cabinet to increase floor space, while the other was the idea of getting a mural done by local art students so that it would be cheaper. We talked about the ADA and insurance in this class. Both are suppose to be helpful, but sometimes they can be really frustrating. For example, insurance will not cover anything that would be helpful to a typical person. So while there are excellent communication devices on the iPad that are cheaper than a stand alone communication device; however, insurance won't cover it because iPads are helpful to typical people. Even though it is cheaper, usually by $1,000. What we are finishing up the semester with is learning about wheelchairs. We had a salesperson come in and start to explain the different features. What he said though is we don't have to know what we want for our client, but we need to know what it should do. If we knew what we wanted we would be doing his job. That was freeing. I almost forgot we did adaptive dressing. We learned a few techniques, but what it really boiled down to is just play around with your patient to figure it out. Since each client has unique abilities and limitations everybody is going to be different. We had someone with a spinal cord injury demonstrate dressing, transfers, and talk in general. What I took away from that was equipment is not always the answer, while it may make the task easier it does not help if you do not bring the equipment everywhere, which is a huge hassle. Overall, it has been an enlighten semester.